This weekend saw the lovable, banana shaped evildoers from Despicable Me and Despicable Me 2 return to the big screen. In Minions, we get to see the semi-origins story of the bad guys you want to love, and maybe eat (they do look like bananas after all). The Minions can’t seem to keep a master. Time after time, we see the Minions accidentally offing the one who’s supposed to be leading the tribe of yellow guys. Then, hilarity and leadership lessons ensue. The movie opened with the comical deaths of the Minions former masters. We see a T-Rex take a tumble down a hill and off a cliff, Egyptians crushed by a pyramid, and Dracula killed when the Minions open up the curtains for his surprise birthday party. Over and over we see the Minions losing their master. But, like the narrator said, the Minions never give up. They continue to look for someone to lead them. Could you imagine failing time and time again? What would you want to do at that point? Probably give up. The Minions show us another way. We’ve got to keep on keeping on. Don’t give up. 2. Someone has to step up – After we see how the previous Minion masters perish, we find the Minions in an ice-covered cave. They’re despondent and about to give up. Then, Kevin steps up to the mic and takes charge. He knew sitting in a cave without action would get them nowhere. Someone had to do something and he was the Minion for the job. To be a leader, one has to be willing to step up and take charge when it’s needed. A leader doesn’t sit back and wait until there’s no time left. He gets things done. We’re told, almost for the get-go, that the Minions need a master. They need someone to lead them. Without a leader, the Minions became lonely and depressed. This seems odd at first glance. The Minions had each other and their tribe was large. Still, something was missing. And that was a leader. You may think your team doesn’t need you to be there. That they don’t need a leader to show the way. Give them a leader they can look up to. It may seem odd to include a quote about being evil in a post about leadership, but I want to take this in another direction. Madge mentioned that her husband became good at being evil after a lot of trial and error. He wasn’t evil overnight. We can apply this thought to leadership as well. When we desire to be a good leader, it doesn’t happen overnight. You have got to practice leadership skills. You have to work on personal skills. You’ve got to work on yourself. You won’t be a good leader right away. But you can be a great leader someday. 5. Hope changes things – In leadership lesson 3, I mentioned the Minions were lonely and depressed. They didn’t know how long they could go on. Why was this? What would make the Minions so hopeless and sad? Their depression came from a lack of hope. Kevin, one of the Minions, chose to step up and give those little guys hope. You’ve got to do the same thing in your position as a leader. Your job is not only to get the job done but to give your team and organization hope. 6. Everyone will respond differently to the direction of your organization – When Kevin said he was going to step out and explore the world, he needed volunteers to help him. He asked the tribe of Minions for help. Only 2 Minions responded. Bob and Stewart took the call. As they step out of the cave, we learn they had different feelings about the journey ahead. Each of these characters was going on the same journey. All of them felt a different emotion. You’ll experience this with your organization. You’ll see people ecstatic to go in a new direction. You’ll discover other people who are scared to death of what it means to them and the organization. You’ll also see those who just don’t care. 7. Be a guide – The Nelson’s were an evil bunch. This included their son and daughter as well. They were evil and they wanted to show the world. But their daughter showed us a great leadership lesson when she sat down with the Minions to discuss who they should follow. She pulled out her magazine of evil supervillains and broke down who was who. She also gave a yay or nay on whether or not they were worthy of being followed. Be like this young girl. Take the time to explain to your team the direction you’re going and why you’re doing it. 8. People are eager to follow – The Minions were eager to follow anyone who showed the slightest hint of being evil. They needed a master and it could have been anyone, as long as they were evil. There are plenty of people out there who are eager to follow. They want someone to be the visionary and lead. Can you be a leader to one of these people? That’s up to you. 9. The wrong people on the team can be dangerous – Seeing the demise of the former Minion masters was meant to be funny. To me, it also felt a bit sad. The Minions, who were following their leader, lead the master to his demise each and every time. They were the cause. Like Jim Collins says in Good To Great, you need to get the right people in the right seats on the bus and get the wrong people off of the bus. Seeing the Minions in action, this exemplifies the reasoning behind it. Bad team members bring about bad results. 10. Make the best of bad situations – Late in the movie, we see the Minions were able to carry out the plan of Scarlet Overkill. They obtained the crown and, inadvertently, one of them became the king of England. This made Scarlet furious. She thought the Minions were trying to usurp her and, once she got her way, she tossed the Minions into the castle dungeon where they were to be tortured. The dungeon was supposed to be a scary place. One where the Minions would be hurt. Even in this dark place, the Minions found a way to make it enjoyable. They played games and had a good time. We’ll face many times of trial and tribulations as we lead. Situations won’t go right or team members will leave. It’s during these times you will have to make the best of your bad situations. 11. We’re often misunderstood – The reason the Minions were in the dungeon was because Scarlet Overkill had misunderstood their intentions. She didn’t even try to listen to their explanation. There will be times when you will be misunderstood. The actions you’ve taken will be seen as hostile or, maybe, lackadaisical. Our reactions to these misunderstandings will cement how others see us as leaders. Respond well and you’ll be received well. Respond poorly and you’ll have a challenge on your hands. There hasn’t been a recent movie that has made me laugh this hard in quite a long time. For that alone, I think the movie is worth a watch. Minions also does well with mixing elements children and adults will enjoy. Throughout the whole movie I heard kids mimicing the characters in the movie and the adults laughing. Question: Have you seen the movie Minions? 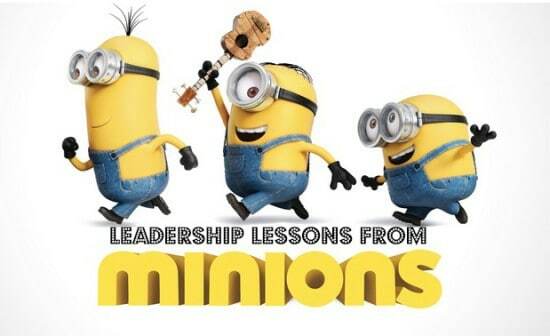 If so, what leadership lessons did you take away from the movie? If not, what was your favorite leadership lesson I shared? Let’s talk about this in the comment section below.